I love this book. Joe Frazier was my favorite and I still love this book. 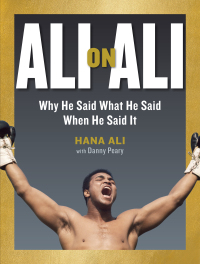 Muhammad Ali was known for so many quotes and I love that his daughter, Hana, explained them all. I lived through his era but I didn’t know the origin of some of these. “I shook up the world” is a quote that is copied every year by a lot of athletes who proclaim “We shocked the world”. I was a toddler then but my dad watched the Ali-Liston fight and I’ve seen it replayed more than a few times. This book is loaded with classics just like this. I love the pictures of him and Howard Cosell. I was a big fan of Howard. Workman Publishing has a real hit on their hands. This is a great gift for any sports fan.